Now in his mid-sixties, drummer Jeff Hamilton has a distinguished track record. Hamilton has featured with big bands (Basie and Herman plus the Clayton-Hamilton Jazz Orchestra, formed with the Clayton brothers, John and Jeff) and with small groups alike. He has also a long musical association with singer/pianist Diana Krall, on disc and in live performance. There's an excellent example of Hamilton at work with Krall on a filmed concert in Rio of a few years back but he's there, too, on several of the tracks on her latest album, Turn Up The Quiet. On this occasion, however, he's in the familiar company of his fellow-trio members, Israeli-born pianist Tamir Hendelman and bass player, Christoph Luty. Hendelman is a superb pianist while Luty has been compared to the great Ray Brown and was mentored by John Clayton. The trio have been together for 17 years, a period reflected in the empathetic way they relate musically to one another. This latest CD is their third for Capri Records. Recorded in front of a live audience in San Pedro, it's a gem of small group collaboration. The album is dedicated to Hamilton's mother, Harriett, who passed away shortly after the disc was completed and it proves to be a fitting tribute. In performances of such high quality, it's difficult to highlight particular tracks but here goes. The band are straight out of the blocks with a hard swinging Hamilton original, Sybille's Day. There is powerful and inventive piano from Hendelman, coupled with the usual impeccable drive from Hamilton and solid support from Luty. Put simply, it rocks. Poinciana, associated with Ahmad Jamal, is a tuneful piece where expansive piano, nimble bass and consistently interesting drums combine to stimulating effect. I Have Dreamed, a classic Rodgers and Hammerstein composition from The King And I, is sublime. Luty's bowed bass begins and ends a restrained but meltingly romantic rendition. In Walked Bud, written and first recorded by Thelonious Monk in 1947, is given a thoroughly creative work-out with everyone on top form. Tamir Hendelman has delivered a masterly arrangement for this track. Hoosier Friend (for the uninitiated, a Hoosier is a native or resident of Indiana, Hamilton's home state) is a composition by the drummer Joe LaBarbera who presented a framed copy of the piece to Jeff Hamilton on the occasion of his 60 th birthday. As we might anticipate there is lots of scope for Hamilton to shine, especially with the brushes. Just when the listener believes this one has come to an end, back comes the group with a relaxed and sparkling extended coda. Oh, and there are a couple of quirky quotes from the tune, Back Home Again In Indiana, for good measure. Hammer's Tones is another vehicle for Hamilton's talents, written by a close friend, the late George Robert, a Swiss-born saxophonist and composer. There's some emphatic piano from Hendelman at this point, too. Gina's Groove is an urgent and stylish tune which references Jeff's god-daughter. Gina is John Clayton's daughter and he wrote this piece for her. Brush This is another John Clayton composition and is a Hamilton set-piece for the Clayton-Hamilton Jazz Orchestra re-arranged for a trio by Jeff himself. It's as gently swinging as you could hope for. Bennissimo is a tribute to pianist Benny Green from the pen of Hendelman. He has produced a theme which fairly races along, allowing the group members to show how accomplished they are at uptempo numbers. Another drumming masterclass is a further feature. Gary, Indiana is a Latin-flavoured version of the show tune from The Music Man, easy on the ear. 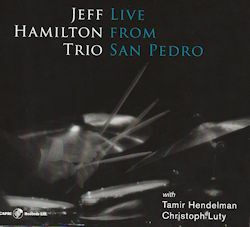 The Jeff Hamilton Trio is always a pleasure to hear and this new release is no exception. The listener is guaranteed moments of sheer excitement and immaculate playing from three musicians at the top of their formidable game. They are a team, and it shows!